Dr. Chacko is extremely good, courteous, professional and easy to talk to. His front office staff members are excellent, in particular, Ms. Sanjana, she is very cordial, diligent, courteous and helpful. Definitely 5 star service!! Highly recommended. 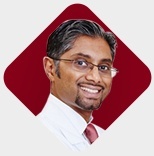 Excellent Staff, Dr. Chacko is very tentative to his patients needs and is extremely knowledgeable in his field. Everyone’s very kind and helpful. Very informative. Awesome place! Dr. Chacko is very knowledgeable, patient and Listens to my concerns. I like the fact that he doesn't force pain meds on me. He does Stem Cell Therapy which can treat degenerative conditions that cause chronic pain, but he never tried to Upsell. This is something I may definitely try in the future. His staff are professional, welcoming and kind. They also keep up with all paperwork I have had acupuncture before, but Kevin beats them all. He actually utilizes what he learned from traditional Chinese Medicine AND IT WORKS. You'll never regret coming here.